It’s not common that I open up a pair of headphones and let out an audible ‘wow.’ Not common, but still possible, apparently, as I found out when I opened up the Meze 99 Classics. Of course, boutique headphones can often be a bit hit and miss. There are dozens of headphone manufacturers out there, and they can’t all be great. The 99 Classics most certainly look like luxury, but do they sound as such? We took them for a spin to find out. Let’s start with the obvious. The 99 Classics look great, and not just as a whole. A lot of attention has obviously also been given to the finer details — for example, the cables are made from kevlar, not plastic, and as such are much stronger than your typical headphone cable. Even the packaging and carrying case look amazing. Interestingly enough, you don’t have to adjust the headphones for differently sized heads. Instead, they adjust automatically with the headband, which stretches if it needs to. This allows for a quick fit without having to mess around with earcup placement. The earcups themselves are built with a wood — either walnut or maple — giving them a very unique yet very classy look. If you choose walnut, you’ll also be able to choose from silver or gold hardware, and in our opinion, the gold gives the headphones an extra luxurious look. Holding the ear cups and head band together is a black metal frame, which we assume was important in keep all the parts from falling apart, but most certainly adds some extra bulk to the 99 Classics. In fact, in general, these are bulky headphones. They’re not something you will probably take out of your home. If you do, however, you’ll have a pretty strong carrying case to do it with. 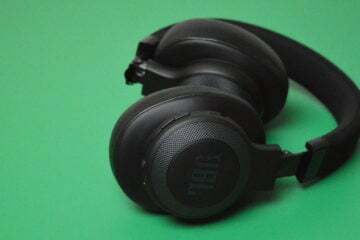 The case actually comes in two parts — the case for the headphones themselves, and a little bag that carries the cable, 1/8-inch to 1/4-inch adapter, and even a dual-channel plane adapter, which isn’t something that often comes with high-quality headphones. That little bag is a separate component to the carrying case, but it fits inside nicely, which is helpful. You get two cables with the Meze 99 Classics — a shorter 47.3-inch cable with an inline playback remote, and a much longer 118-inch cable, which is great for those of us who want to use their headphones to watch TV or need a little extra reach. With the two cables, 1/4-inch, and plane adapter, Meze didn’t skimp out on the accessories by any means. The headphones don’t just look great, they feel pretty darn nice too. Even after long periods of listening, the headphones didn’t feel too heavy or constricting by any means. The headband fit snuggly on the head, and while it stretches a little, it didn’t exert too much pressure, at least for us. Someone with a larger head may feel differently. The only real drawback to the Meze 99 Classics in the comfort department is that, at least after extended periods of time, they get a little warm. That’s not really a big deal for most people — they didn’t induce profuse sweating or anything like that — they simply got a little warm. Despite note being noise canceling headphones, thanks to the type of foam uses on the earcups, you get pretty decent isolation. Of course, you probably don’t need it, even if it is there — these headphones can get loud. Forget about volume though — these headphones sound great. Highs are very crisp without being too piercing, there’s enough bass to please most, and the mids give the sound an accurate sheen. The 99 Classics are largely aimed at being accurate to music, not at enhancing it in any way, and to that end they do very well. There are a few problem areas in the high-mids, but really not noticeably so. Low-mids are plenty warm, and while the overall sound might not be described as overly warm, that’s a good thing when you’re pursuing audio accuracy. Of course, not everyone wants an accurate listening experience. Some want boosted lows and highs, while cutting a few of those mids. To that extent, the 99 Classics aren’t for everyone, despite the fact that they sound great on all styles of music. The Meze 99 Classics look great, feel great, and sound great, but they have a price tag to match. These headphones are for those that appreciate excellent sound quality and design, not for those who need a pair of cans for the bus ride to work or who want some headphones to watch their favorite TV shows on. At $309, these headphones aren’t necessarily a “steal,” but you get what you pay for — high quality.